SpectraBusters board member Debra Johnson will be a panelist at the June 1st Lowndes County Democratic Party monthly meeting about environmental issues and property rights, 6PM 1 June 2015, at the Lowndes County Board of Elections office, 2808 North Oak Street, Valdosta, Georgia. This topic obviously includes among other issues the Sabal Trail fracked methane pipeline. Other panelists will be from the Lowndes County Commission, WWALS, WACE, and SAVE. 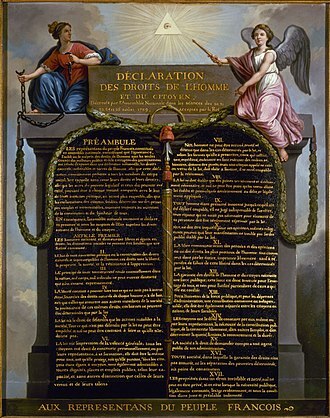 For all these reasons, on behalf of my constituents and the citizens of Lowndes County and the state of Georgia, I oppose the Sabal Trail pipeline anywhere in the County of Lowndes or the State of Georgia. I urge that FERC reject any permit for the Sabal Trail pipeline, or at the very least move it entirely out of the State of Georgia. 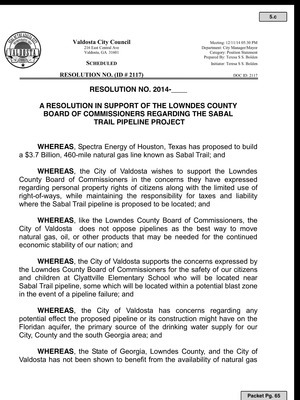 The mayor of Valdosta has filed with FERC a resolution against Sabal Trail, in support of the resolution by Lowndes County, the most populous county on any of the proposed pipeline paths in Georgia. 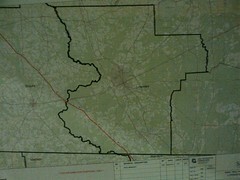 In addition to echoing Lowndes County’s concerns about property rights, safety of school children, lack of benefit to the state of Georgia, the availability of a path to completely bypass Georgia, and public opposition, Valdosta also added a WHEREAS about the Floridan Aquifer, the source of almost all of our drinking water in south Georgia and Florida. See also LAKE videos of Valdosta and Lowndes County passing those resolutions. It’s time for more counties to follow Dougherty County’s lead and pass resolutions against the Sabal Trail pipeline. 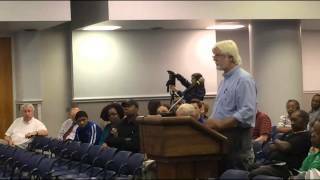 Local protests in Valdosta and citizens speaking before local governments emphasize that point. Protestors gathered on Oct. 31 at the corner of Park Avenue and Patterson Street to argue against the building of the Sabal Trail gas pipeline. The protesters were associated with VSU’s Students Against Violating the Environment and Wiregrass Activists for Clean Energy. The costumes they were dressed in for Halloween attracted honking and “thumbs up’s” from those driving by. Zombies, monsters, ghosts, and inhuman pipelines join forces to STOP Sabal Trail Pipeline! That’s in Valdosta, Georgia, in front of the Sabal Trail fracked methane pipeline office. 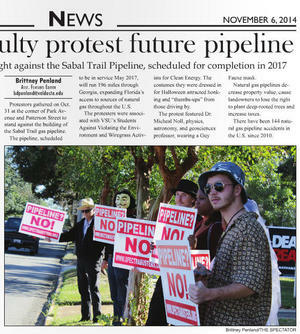 Second day in a row, the Albany Herald covered the Sabal Trail fracked methane pipeline making the Georgia Water Coalition Dirty Dozen list. The Flint River would be affected just like the Withlacoochee River, and in Florida the Suwannee River and the Santa Fe River are in the same karst limestone that contains our drinking water in south Georgia and Florida in the Floridan Aquifer. These newspaper articles follow two previous Albany ones, a couple of Valdosta ones, and local, state, and national TV and newspaper coverage of protests and opposition to Spectra’s hazardous boondoggle. Sabal Trail’s terrible, horrible, no good, very bad PR week continues….